NOTICE: Activation key must be used on a valid Steam account. Requires internet connection. About the gameThis unique action adventure game lets you become Haimrik, a young scribe trying to make a living in a medieval town full of warriors, sorcerers, dragons and dragon-riding sorcerer-warriors. But one book changes his whole life. With the help of Masamba, a hungry lioness who will protect h… im while constantly trying to eat him, he’ll venture out to take on the evil king and his elite generals, the Word Warriors.Fortunately, Haimrik commands the Power of the Words! These are the stones in the path Haimrik walks, and he brings them to life as he steps on each one, willingly or not. 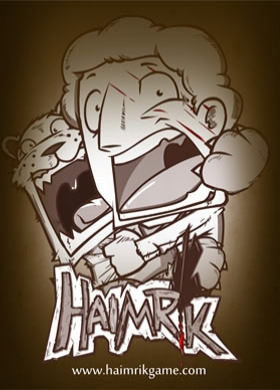 Haimrik will need to activate the right words to defeat the various enemies that challenge him across numerous Word Worlds, with new puzzles appearing constantly throughout the game. In an added touch, Haimrik will undoubtedly die many horrific deaths, leaving pools of red blood contrasting with the otherwise plain sepia-toned world.Be part of a medieval revolution against the Word King and his elite warriors, and change the way you see words and stories forever. Key Features Unique action adventure built upon interactive words. Medieval comedy full of dark humor and over-the-top cartoon violence. Rare sepia-toned view of a medieval fantasy world. Eccentric characters to meet and adventure with, like the lioness Masamba who will protect Haimrik from harm... when she’s not trying to eat him. System Requirements Windows - Minimum OS: Windows 7 / 8.1 / 10 Processor: Intel Core i3 Memory: 4 GB RAM Graphics: Intel HD Graphics DirectX: Version 9.0c Storage: 3 GB available space Sound Card: DirectX® 9.0c compatible © 2018 1C Company. Developed by Below the Game. All rights reserved.